A printed circuit board (PCB) makes your project smaller, more tidy and more reliable. It allows others (or yourself!) to more easily duplicate your work. This page outlines the supplies needed, and my other page gives the procedure. There are many combinations of paper, etchant, and ironing and cleaning processes that will work. This web page describes what I used. For more ideas and a thorough comparison of alternatives, please refer to Tom Gootee's page which deserves all the credit for figuring this all out. 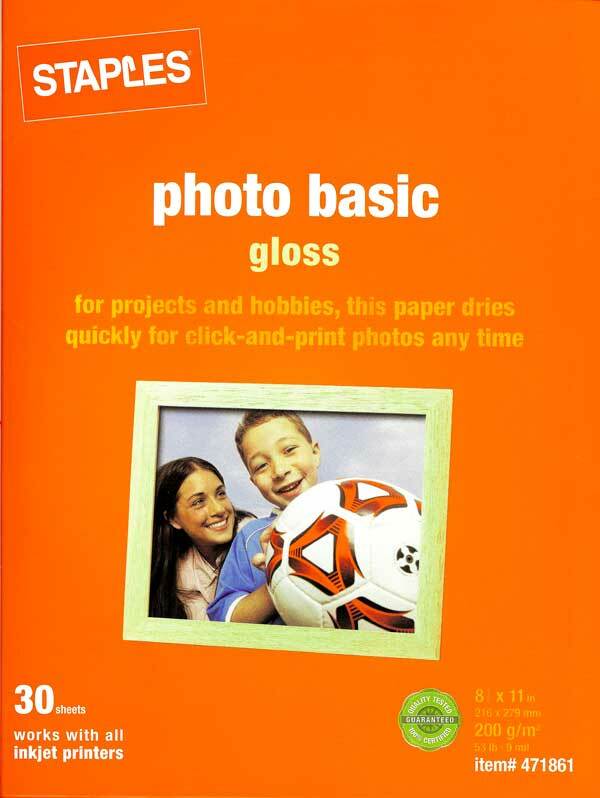 Staples "Picture Paper" available from www.staples.com or the Staples office supply retail stores. There are several other papers discussed on Tom Gootee's page, but Staples Picture Paper worked well for me. Click the image for a closer look at the package. It was stocked on local shelves around Seattle in September 2005. It is generally better to use the manufacturer's toner cartidge. The genuine HP cartridges have "microfine" toner particles, which is maybe not just marketing hype after all. I used an HP LaserJet 1200 with the recommended HP C7115A toner cartridge. Common blank printed circuit board material has two thicknesses. You can buy either 1 or 2 ounces per square foot. The 1-ounce variety is excellent for most small projects, and is easier to etch than the 2-ounce boards. Blank PCB material is available from many vendors - just round up the usual suspects such as Radio Shack, Mouser Electronics, Jameco Electronics and so forth. You can expect to pay about $10 to $15 USD per square foot, or three to five dollars for smaller sizes such as 4" x 6". To save yourself some work, think about choosing a blank PCB with one dimension equal to your final board size dimensions. This saves cutting fiberglass. You need a small plastic tub for soaking and etching your printed circuit board. I used a cheap minature paint tray from the local hardware store. Choose a tub size that is slightly larger than your PCB. There are lots of options for building your own PCB etching tank, including heaters and agitators. There are suggestions for building your own tank on Tom Gootee's web page. Also there are both commercial and hobbyist tanks available. Google for them. Clothes iron to fuse the toner onto the bare PCB. A regular clean household hand-held electric iron works great. Tom Gootee has only used Ferric Chloride for etching. Jameco Electronics — in powdered form. A single order of Jameco's item # 70201CD will make 1 pint of Ferric Chloride liquid etchant, when mixed with water. One pint will usually etch at least a couple square feet of the 1-oz board. Be careful with the Ferric Chloride. It won't burn you, under normal circumstances using rubber gloves, but it STAINS almost everything. And it seems to permanently disfigure almost any type of metal that it touches, even for a moment. (So don't use it in your good stainless steel sink!) It might hurt metal pipes, too, if it's very concentrated. In some areas it is illegal to dump used etchant down the drain, even if diluted. See Tom Gootee's web page for ways to neutralize used acid bath chemicals. Keep several spares on hand since small bits can easily break. Solid carbide drill bits will last the longest. They run better at 30,000 rpm or higher, such as with a Dremel tool at maximum speed. They are said to run the best at 100,000 to 200,000 rpm. Note they will break very easily with just a little side pressure from a finger. A drill press is useful, but make sure it is very precise in motion and has no run-out (wobble). You may find boxes of 50 solid-carbide PCB drill bits for about $5 - $10 at larger hamfests (see ARRL for schedules). They are also available on eBay but may cost up to $20 a box. And there are places online that sell them, too.